Acropora cervicornis, commonly known as Staghorn coral, as found in the wild. 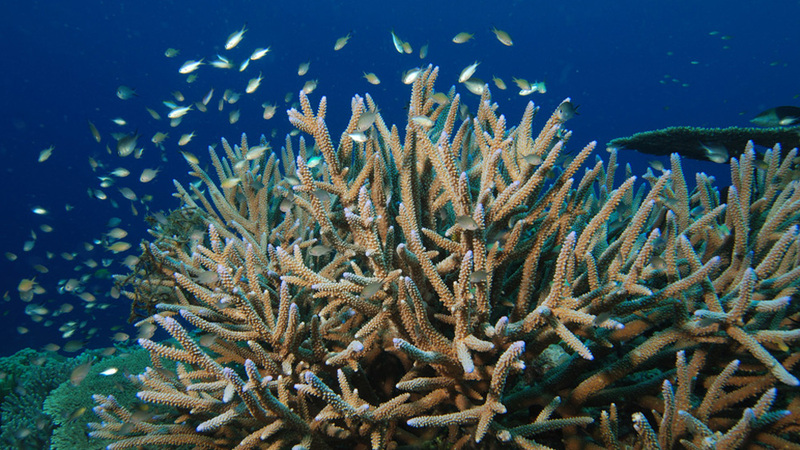 A research report1 by the National Oceanic and Atmospheric Administration in collaboration with the University of Miami studied the impact of light and partial pressure of carbon dioxide (pCO2) on the growth and photochemical efficiency of Acropora cervicornis, commonly known as Staghorn coral. The endangered species was once thriving in the Caribbean. Its deterioration was the result from disease and physical disturbance by hurricanes. This study investigated the interacting influences of light and pCO2 on the Staghorn corals in order to plan for future restoration efforts. While the use of 3D scanning technology has been proven valuable in scientific research due to its ability to capture high accuracy measurements of specimens, this is the first study the researchers are aware of that used 3D scanning to monitor the growth rate of living corals. Previous research studies using 3D scanning required the corals to undergo lethal procedures or rendered fatality for the study. 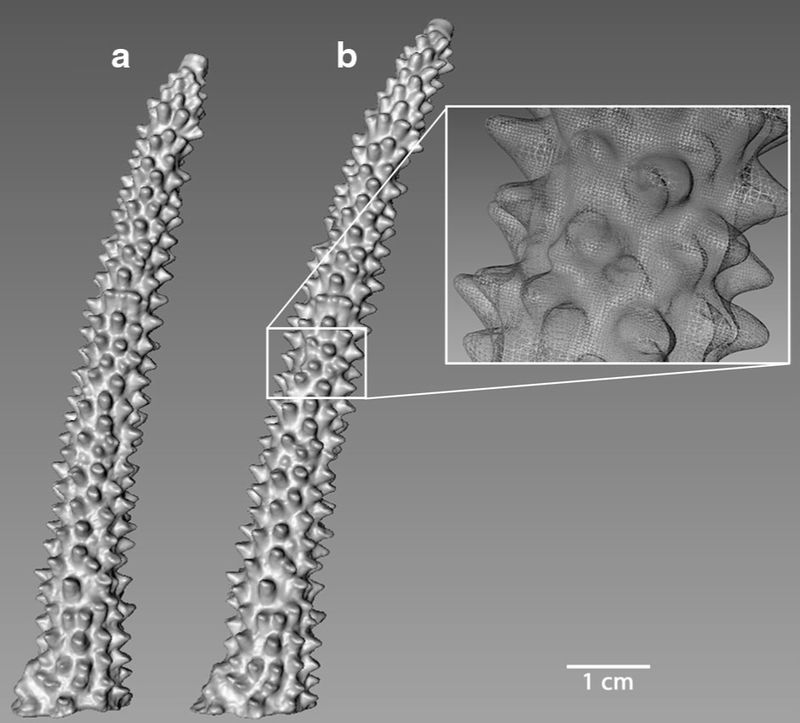 In the study, researchers measured the volume growth of the coral specimen using the HDI Advance 3D scanner. In order to determine if the coral had grown during the experiment each specimen was 3D scanned at the beginning of the experiment and then once again after 28 days when the experiment was over. Due to the delicate nature of corals, researchers made great use of the automated rotary stage in order to reduce the overall time that the coral was exposed to air. Each coral was scanned at every 20° around the central axis. Eighteen scans were captured in total for each coral in 360° with minimal time and effort from the user. Each coral was only exposed to the air for a maximum of one minute, with no harm done to the health of the specimen. A photo showing how a rotary stage works. 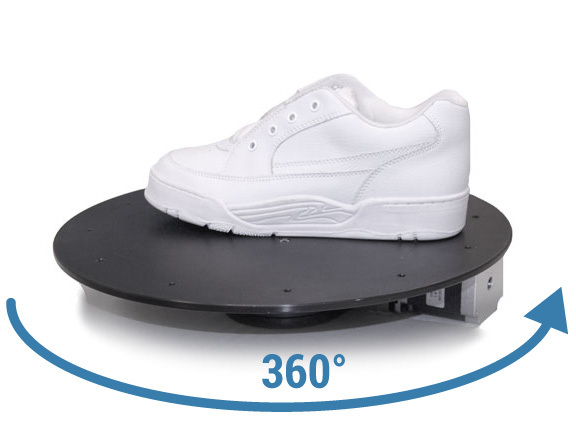 A rotary table is a useful tool for automating 3D scanning by turning the object horizontally in 360° while the 3D scanner captures multiple scans of the object at each angle. The scans are then merged to form a digital 3D model. View the shoe in 3D. Once the scanning was done, the scanner’s software engine, FlexScan3D, did the majority of scan data processing work. It auto-aligned and combined individual 3D scans into a digital 3D model of the coral sample that would be used to analyze the height of the coral using the point-to-point measurement tool in FlexScan3D. Leios software was used to analyze the volume of the watertight STL model. The use of 3D scanning in scientific research: Three-dimensional scans of A. cervicornis at the start of the experiment (a) and after 28 days (b). Image on the right shows detailed resolution of digital mesh composing the model. To learn more about the results of the study on how light and partial pressure of carbon dioxide (pCO2) impacted the growth and photochemical efficiency of the Staghorn coral, please read the full report. Since the publication of the research findings, HDI Advance 3D Scanner, along with FlexScan3D, have gotten even better in performance. The research paper mentioned the researchers had to manually trim out unwanted scan data. Since then, FlexScan3D has added new features such as the cut-plane tool for users to select a plane based on data and delete everything below the plane. This gets rid of unwanted data, such as table or fixtures, making scanning much easier. Another great feature that has been added is a calculate deviation function which does a measurement comparison between two similar 3D models. Researchers can compare coordinates across specimens to see how they relate or differentiate from one another. Overall, this research study demonstrates the value of using advanced 3D scanning technology for 3D measurement applications. We look forward to seeing more uses of 3D scanning technology to facilitate research studies in the future.